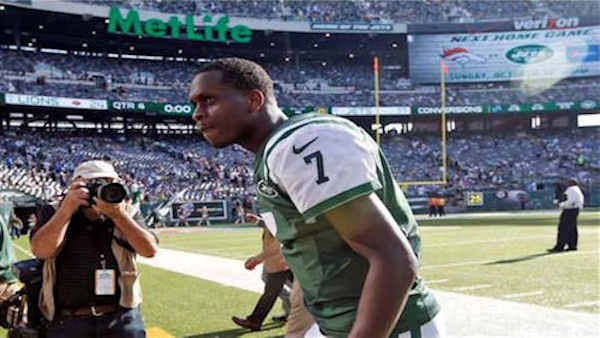 FLORHAM PARK, N.Y. -- Geno Smith's hopes for a breakout season with the New York Jets took a major blow - to the jaw. The quarterback will be sidelined at least 6-10 weeks with a broken jaw after being punched by teammate Ikemefuna Enemkpali in the locker room Tuesday morning. Smith, entering his third season, required surgery to repair the injuries. Coach Todd Bowles made the stunning announcement in an impromptu news conference before training camp practice was scheduled to start. Enemkpali, an outside linebacker in his second season, was immediately released by the Jets. Bowles said Smith and Enemkpali got into an "altercation" in the Jets' locker room Tuesday morning. "It had nothing to do with football," Bowles said. "It was something very childish, and he got cold-cocked, sucker-punched - whatever you want to call it - in the jaw." Bowles wouldn't go into detail about the nature of the altercation, except to say: "It was something very childish, that sixth-graders could have talked about. It had no reason for happening." Sources told ESPN NFL Insider Adam Schefter that a disputed debt of $600 was at the heart of the matter. Smith accepted a $600 plane ticket from Enemkpali to appear at the linebacker's football camp in Pfugerville, Texas, according to sources. Problems arose when Smith did not show to the camp, which took place days after someone close to Smith died in a motorcycle accident in Miami, sources said. After Smith did not attend, Enemkpali demanded that the Jets quarterback refund him the $600 he allegedly used to purchase a plane ticket. Smith told Enemkpali he would reimburse him the money, but he did not. Enkempali confronted Smith Tuesday about the money and the confrontation ended in a punch and broken jaw. Some who heard the exchange believe Smith allowed the situation to escalate. "Push the envelope to a certain point and and then just stop, because certain guys are sensitive to certain words or certain things, certain subjects, so it's just something that went a little bit too far," said cornerback Darrelle Revis. Smith, who was having a good training camp, will be sidelined for the rest of the summer and likely for the first few games of the season. The season opener at home against Cleveland on Sept. 13 is five weeks away. "Depending on how surgery goes, we'll see where we go from there," Bowles said. Smith took to Instagram and posted a picture of himself sitting in a car - mouth closed and looking stern - and a simple message: "ILL BE BACK." In a statement issued to The Associated Press by his agent, Enemkpali apologized to the team and fans. "Geno and I let our frustration get the best of us, but I should have just walked away from the situation," Enemkpali said. "I deeply regret and apologize for my actions. It was never my intention to harm anyone. I appreciate the opportunity I had with the Jets." Bowles said the Jets could add another quarterback, but it appears veteran Ryan Fitzpatrick will assume the starting job. Bryce Petty, a fourth-round pick this year out of Baylor, and undrafted free agent Jake Heaps out of Miami are the Jets' other remaining quarterbacks. It was a jaw-dropping announcement by Bowles, who earlier in camp had to deal with the news that star defensive lineman Sheldon Richardson was suspended four games by the NFL for violating the league's substance abuse policy and then was arrested after a high-speed road race in Missouri 12 days later. Richardson could face additional discipline by the league for violation of the personal conduct policy once the legal process plays out. Bowles, in his first season as coach, spoke for about 2 minutes before heading to a meeting and then practice, but was clearly angered by the situation. "The team knows this is something we don't tolerate, something we can't stand," Bowles said. "You don't walk up to another man and punch him in the face." While the players were not immediately available because they had practice, wide receiver Brandon Marshall sent out a simple "cryface" emoji on his Twitter page. Marshall and Smith have been developing solid chemistry this offseason, with the two spending time together on and off the field. It was unclear as to whether there had been previous bad blood brewing between Smith and Enemkpali. "If you have a team and you have a bunch of side issues, you can't tolerate that," Bowles said. "This is something that happened in the locker room and we're dealing with it internally and that's where we are right now." Smith has had a rough two-plus seasons in the NFL, starting with his slip to the second round of the 2013 draft. He got the starting job as a rookie after Mark Sanchez was sidelined for the year after hurting his shoulder in a preseason game, and mostly struggled. Last year, he had a few flashes of solid play, but again had issues with turnovers and consistency and was benched a few times in favor of Michael Vick. Smith has 34 interceptions and 41 total turnovers in his first two seasons, but new offensive coordinator Chan Gailey was impressed with his progress this summer. Smith threw the first two interceptions of camp on Monday, an impressive stretch that had the quarterback and coaches thinking positively about his prospects for the upcoming season. "He took time that month when we were away (before training camp)," Gailey said of Smith shortly before the news broke. "He looked at it and studied it and talked about it and thought about it. When he came back, he really had a grasp of it." Enemkpali had three sacks in six games last season after being taken in the sixth round out of Louisiana Tech. To replace Enemkpali on the roster, the Jets signed cornerback Javier Arenas, who has played five NFL seasons with Kansas City, Arizona and Atlanta.